Erik Swensson is an AWS Solutions Architect. AWS Solutions Architect Patrick Shumate also contributed to this post. This post explores customer options for building multi-region or multi-availability zone (AZ) clusters. By default, Amazon Redshift has excellent tools to back up your cluster via snapshot to Amazon Simple Storage Service (Amazon S3). These snapshots can be restored in any AZ in that region or transferred automatically to other regions for disaster recovery. Amazon Redshift can even prioritize data being restored from Amazon S3 based on the queries running against a cluster that is still being restored. However, sometimes requirements demand a faster Recovery Point Object/Recovery Time Object (RPO/RTO) of a full-scale operational Amazon Redshift cluster. Additionally, Amazon Redshift parallelizes queries across the different nodes of a cluster, but there may be circumstances when you want to allow more concurrent queries than one cluster can provide. You can achieve this by deploying two (or more) identical, independent parallel Amazon Redshift clusters. This design requires all database updates to be performed on all Amazon Redshift clusters. The source of each data load and modification query puts all update queries into Amazon Kinesis. In the image above there are three parallel clusters in two different regions, but you can choose any region/AZ combination. There will be one Amazon Kinesis subscriber for each parallel Amazon Redshift cluster. The subscriber will be in the same availability zone as the Redshift cluster it serves and will be in an AutoScaling group with a minimum and a maximum of one. That way, any failure of that subscriber is replaced to allow update processing to continue on where it left off. As an update SQL command is written to Kinesis, each subscriber reads it and applies it to the Amazon Redshift cluster it serves. Ensure that updates can get to an Amazon Redshift cluster only through this process so that they all stay in sync. From an analysis standpoint, we will use Amazon Route 53, a fully managed DNS service, to do health checks and latency-based routing to determine which cluster will be accessed by users and tools to perform analysis and run read-only queries on the system. Let’s walk through the configuration. 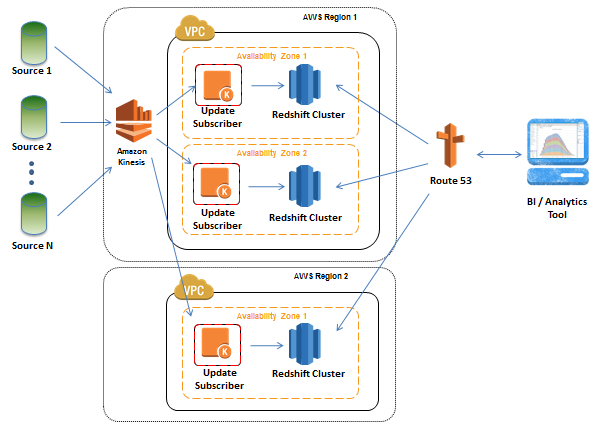 For demonstration purposes, we will use just two Amazon Redshift clusters in the same region, but you could modify these steps to add more regions and parallel clusters. To keep this demo simple, the AWS CloudFormation template will launch in a Default VPC or EC2-Classic. Best practice would be to have each Amazon Redshift DB and Amazon Kinesis reader in a private subnet. We are doing multi-AZ; to do multi-region you’d need to modify the Amazon Kinesis endpoint used by the Amazon Kinesis-enabled subscribers to fit the specific setup required for your database. In this example, we keep things as simple as possible. There are many optimizations that could be made based off your company’s requirements and database environment. If you are updating a parallel or single Amazon Redshift cluster with a frequency greater than one minute, read the AWS Big Data Blog post that explains best practices for micro-batch loading on Amazon Redshift. Be sure you are familiar with all of the Amazon Redshift best practices for loading data. First, create two identical Amazon Redshift clusters in different AZs with the same database name, administrative username, and password. You can start with a small, empty database to try out the process. However, if you were taking an existing cluster and enhancing it to span multiple AZ’s or regions, you would just read-only the database and restore a snapshot to another database to have a starting point for your two identical parallel clusters. Amazon Kinesis Stream that ingests all modification queries. Amazon DynamoDB table to track where each query process in case a processor fails and must be recreated. IAM role that can read from the Amazon Kinesis stream and read and write to the DynamoDB tables created above. Two Amazon Kinesis subscribers instances in AutoScaling groups to read from Kinesis and apply update queries to the Redshift clusters. It also deploys them. The Amazon Kinesis subscriber application code can be found here. These instances use the IAM role to gain access to read from the Amazon Kinesis stream. It uses the Amazon Redshift username, password and endpoints to connect to the clusters to apply the updates as they come in via Amazon Kinesis. This subscriber code is just an example and could be easily modified to accommodate a more complex database environment. Security group around the subscriber instances to allow only SSH port 22 access for administration from an IP address you provide as a parameter. Now that you have a system for keeping the Amazon Redshift clusters in sync, it’s time to modify the database. We start by creating a table. Then we’ll load data into that table from a public data set in Amazon S3. Amazon Redshift can load data directly from Amazon S3 in parallel, so a best practice for data loading into Amazon Redshift is to write to Amazon S3 first. With this configuration we are only putting load SQL statements and updates through Amazon Kinesis, not actual data. You must modify this command and add the Amazon Kinesis stream name from the AWS CloudFormation template. You can do this by checking output from the AWS CloudFormation template in the console, selecting the stack that we just created, and then going to the Outputs tab. For the purposes of demonstration and to keep this simple, we pass the keys all the way from the source to Amazon Redshift. In a real-world production scenario, you would inject the keys by modifying the Amazon Kinesis subscriber application so that you wouldn’t have the keys stored at each source. As always, limit the access-key and secret–access-key to least privilege, so have only read privileges from required Amazon S3 locations and no other privileges. In this case, the data is stored on a public Amazon S3 bucket for simplicity. These put queries into the Amazon Kinesis stream, which are then picked up by the Amazon Kinesis-enabled subscriber applications and applied to each Amazon Redshift cluster. To validate this proces, log into both of the cluster end points directly with a SQL client. AWS provides step-by-step instructions for doing this. Once connected, you can run ‘SELECT COUNT(*) FROM CUSTOMER;’ to confirm that the data is populated in both clusters. (Note: This AWS CloudFormation template will not apply since ‘example.com’ is not a valid domain name. You’d need to modify this to your own domain). "Description": "Evenly Weighted DNS entry myparallelcluster.example.com to two identical Redshift Clusters"
In this example, the DNS record myparallelcluster.example.com is evenly weighted to az1.cluster.example.com and az2cluster.example.com, which resolve to our Amazon Redshift cluster endpoints. In addition to this weighting, create a Route 53 Health Check on each one of these clusters. That way, if something happens to them they are removed from the DNS entry and all future requests are funneled to the healthy clusters. AWS provides simple instructions for creating health checks in Route 53. The status check can be as simple as validating that the TCP port is responding. You could also set up a more sophisticated health check that validates off a website. This website could designate the cluster as unhealthy if it becomes out of sync for any reason, in which case Route53 would stop sending requests to it until it is healthy again. If your clusters become out of sync for some reason, you must decide the best way to get them back in sync. If it’s just a failed query you might be able to re-run that query. If it’s a more complicated problem, you could re-import a table to sync them up. Deciding whether to re-sync depends on the circumstances and the size of data. If you are building a multi-region cluster, employ latency-based routing so that a user is routed to the best cluster possible. Some BI tools can point at just one database and don’t move over automatically the way this article describes; check the requirements of the tool you’re using. In all cases, you want to make sure that only analysis queries are done through this method. Any modification to the database must go through Amazon Kinesis to ensure that it is applied to all parallel clusters. By making Amazon Kinesis the ingestion point for all modification queries and using Amazon Route 53 to deliver users the closest healthy database, we have implemented an architecture that keeps multiple Redshift clusters synchronized. This gives you the power to create a cost-effective, highly resilient, durable, and geographically disperse petabyte-scale data warehouse. Do more with Amazon Redshift!